sLeading change requires more than skill development; transformational leadership requires a transforming leader. ​You can't change what you don't see. ​You won't change if you don't know you need to. Leadership coaching builds awareness of the strategies you're using to get things done, helps you assess if they're effective, and provides the support you need to develop the new patterns of thinking and behavior that will increase your leadership impact. Emotions are part of the equation too. Emotional intelligence is recognized as a key ingredient to pastoral leadership effectiveness. As you build your own emotional capacity and fluency, you'll find it easier to engage in and bounce back from difficult conversations. Who are you and how are you gifted? Exploring and staying connected with your call helps you discover the inner commitment it takes to see long projects through to the end. You have dreams for the people you serve and hopes for the world you care about. We want to help you achieve them. ​"Mary provides coaching at the highest level. Her sensitivity, discernment and the "appropriate" push is excellent. I highly recommend her service to colleagues and friends." An initial conversation by phone or Skype tests the chemistry of our relationship and sets the agenda for our work together. Coaching generally begins with twice-a-month sessions for the first 2 months. From that point you decide the right schedule for you. This approach is ideal when you have a specific task or challenge in front of you. Ready to make a deep commitment to your leadership growth? Coaching's power is maximized when it's linked with a tool that lets you see exactly how others are experiencing your leadership. To what degree are your strategies for working with people and getting things done having the desired impact? How might you be getting in your own way? Our internal assumptions, habits of thought and feeling, and ingrained patterns of action, drive our behavior. The Leadership Circle 360 Profile, gives you a detailed picture of what's working and what isn't, and why. Key opportunities for growing in your leadership immediately rise to the surface. With the support of a personal coach, you'll develop and work a plan designed to grow your leadership gifts of relationship, intellect, and agency to the next level. A 90-minute personal orientation session introduces you to the tool, surfaces learning goals, and helps you determine appropriate evaluators. The detailed workbook, personally tailored assignments and follow-up sessions of personal coaching. help you integrate and deepen your insights and provide support as you implement your insights. 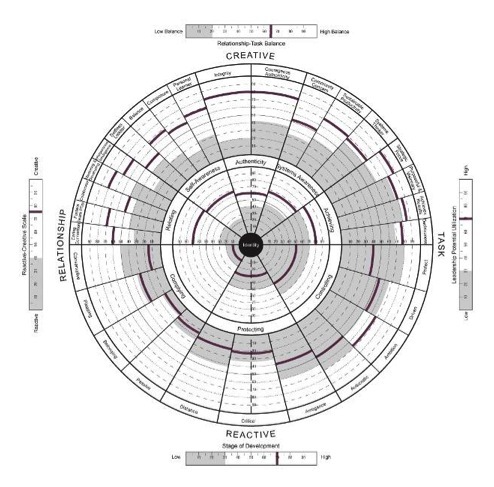 The Leadership Circle Profile integrates beautifully with assessment work you may already done, such as Enneagram, StrengthsFinders, Emotional Intelligence, Stages of Development and the Intercultural Competency Inventory(IDI). Email Mary Huycke to sign up or learn more. "The Leadership Circle Profile 360 pinpointed why things weren't working like I thought they should. It was a painful revelation, but knowing I was being experienced in unhelpful ways and then working on those areas through coaching has made an enormous difference!" "I hadn't realized how much leadership capital I had across my various constituencies. I really liked being able to choose categories for my responders, grouping them by age or ethnicity or ministry area, and then seeing the breakout of that group's aggregate response. So helpful! Now that I know how broadly I'm trusted, I'm much more confident about making those big changes we've been talking about."